From the time when Tusshar Kapoor's son Laksshya was born, he's been the apple of everyone's eye in the Kapoor household, especially to his aunt Ekta Kapoor. The 42-year-old producer is in awe of her nephew and her Instagram account is filled with his pictures. In a latest addition, she shared a click of her with Laksshya and Bigg Boss Season 11 contestant Vikas Gupta on their way to Siddhi Vinayak temple in Mumbai. The trio is seen smiling and baby Laksshya wins the picture with his cute expression. 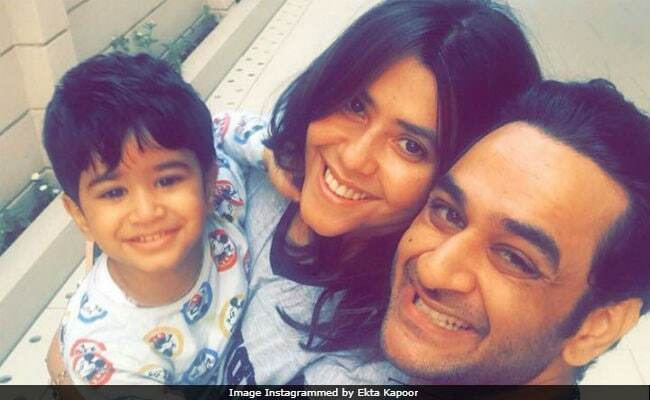 Ekta Kapoor also revealed that Vikas Gupta, who became a household name after his Bigg Boss, was mobbed on way to the temple. Ekta Kapoor captioned her post, "Posing with one star laqu and walking with the other star to Siddhi Vinayak (who got mobbed)!!!" Posing with one star laqu and Walking with the other star to Siddhi vinayak ( who got mobbed)!!! Laksshya Kapoor was born to Tusshar Kapoor via IVF on June 1, 2016. Tusshar Kapoor is a hands-on father and makes sure that his son never misses out on fun. He is often pictured taking him to and out of his pre-school, taking in to his friend's birthday parties and play dates. Take a look at this video of Tusshar participating with his son Laksshya at his play school activity. Laksshya Kapoor has a social circle of his own and is friends with Kareena Kapoor's son Taimur Ali Khan and Karan Johar's twins Roohi and Yash Johar. They are often pictured at pre-organized play dates and birthday parties. My Gunda is an explorer...thank you @reenz290 for an awesome birthday party! Laksshya had a blasttttt! Happy birthday Darling Ranvir! For his first birthday, Tusshar Kapoor hosted a grand birthday party last year, which was attended by Kareena and Taimur, Shabbir Ahluwali and his family, Karan Johar and several of Tusshar's co-stars including Tabu. Laksshya, who is often spotted accompanying his father and aunt on outdoor shoots, has got accustomed to their work schedule and doesn't mind them leaving him back home for long. Speaking about which Tusshar earlier told news agency IANS, "He is okay when I am leaving. He doesn't have too much separation anxiety. From the time the movie (Golmaal Again) started, I would have him on sets. He knows the time when I am going. I spend my time with him in the morning. When I say goodbye, he understands. I have to make him used to travelling more and more. He has to be flexible to changes in schedules and plans." Tusshar and Ekta Kapoor are children of actor Jeetendra and Shobha Kapoor.